There are several methods to install a WordPress plugin. Choose a method below. Unzip the package visual-composer-mailchimp.zip and find and unzipvisual-composer-mailchimp.zip on you computer. Unzip the package visual-composer-mailchimp.zip on you computer. 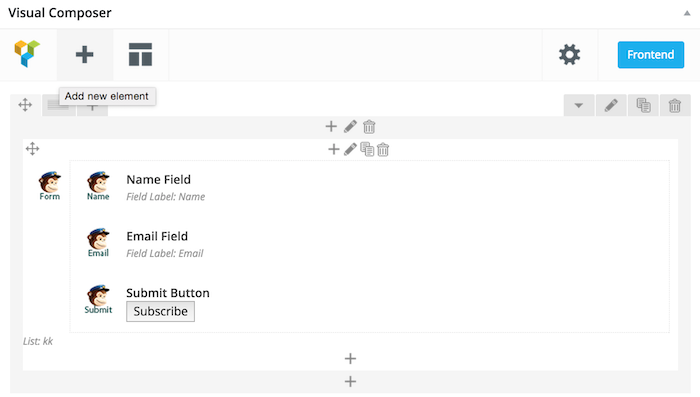 On Edit screen you will notice new Mailchimp Fields. Below is an example with Name and Email Field added. NOTE: You should always add Mailchimp Form Container Field first and then add the name, email, custom and submit field. 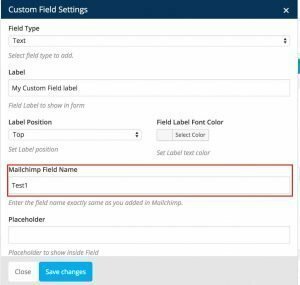 Mailchimp Form Container Field adn Submit Field are required Fields to make form work. Adding custom fields is very easy, just add the custom field to your form container field. The value in “Name” field should be same as you have entered in Mailchimp. Here is the view in Mailchimp.